Rugged multipurpose Enerpac hydraulic cylinders have proven effective in the concrete casting process at Sydney Ports Corporation’s Port Botany Container Terminal Expansion, one of the largest port projects to be undertaken in Australia in the past 30 years. Although the 600 ton ringer crane was capable of lifting the concrete segments straight from the mould, the cylinders incorporated into the formwork system provided peace of mind, ensuring that no damage occurred to the segments during lifting. The Enerpac ZU4 electric-powered portable hydraulic pump used to power the RC-756 cylinders on the Port Botany project is a cool-running, energy-saving pump that sets new durability standards and lower operating costs. The ZU4 series feature a powerful 1.25kW universal motor coupled with a totally new pump element design that reduces oil flow turbulence, producing an industrial workhorse with fewer moving parts and less friction. The pumps’ increased flow rates, reduced heat generation and decreased power needs translate into higher productivity and reliability for applications such as construction, crimping, cutting, fabrication, lifting, lowering, materials handling, maintenance, pressing, pushing, pulling and production and process engineering. The ZU4 series is best suited to medium-to-large cylinders or hydraulic tools – or for use wherever high-speed, intermittent duty cycle is needed. The pumps are available with backlit LCD and multiple valve configurations for remote or manual control of advance, retract and hold combinations. 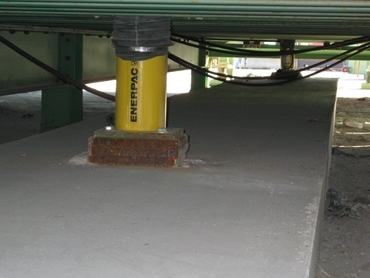 “The Enerpac cylinders do the job well. This type of job doesn’t come around very often, but in the event that it did, we would consider using Enerpac cylinders for striking again if required,” said Senior Project Engineer John Gadallah.